The students of our “Little Red Schoolhouse” have been very busy and actively learning. This past week we had a wonderful variety of events. On Monday, February 4th we had a visit from Mrs. Chen, the mother of our 5th grader Chloe, who gave a fabulous presentation on the origin and the meaning of Chinese New Year. Each student got to try their hand at Chinese calligraphy. 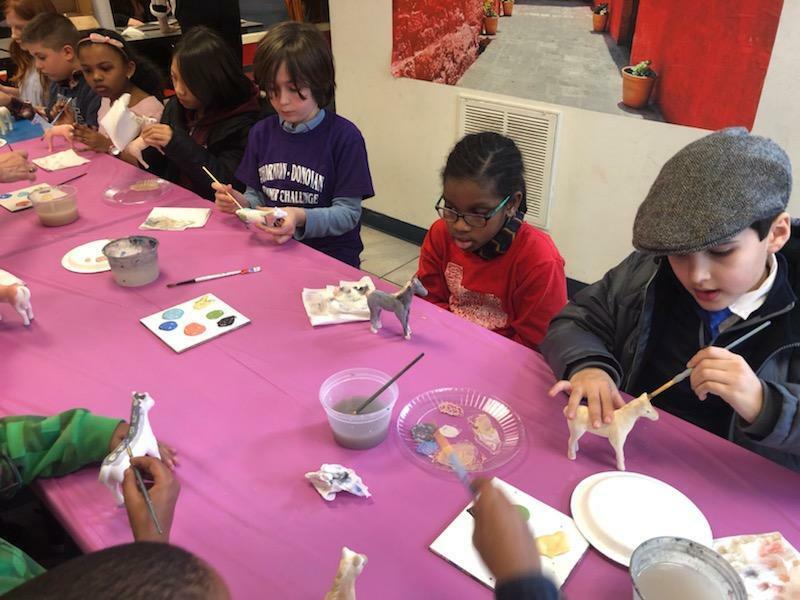 On Wednesday, students designed and painted their own ceramic Mongolian horse under the guidance of T-D’s resident artist, Mrs. Bubesi. Students also listed to the Mongolian Folk Tale, Suhu and the White Horse. It tells the story of the origins of the Mongolian stringed instrument, the morin khuur-a horse-headed fiddle. Students will be able to take home these precious keepsakes after they have been fired in the school’s kiln. We finished the week with a visit from Pelham author, Nick Vianna, who wrote The Pie Shaper Caper. Mr. Vianna read his fantastic book out loud and then “walked” students through his process of both writing and illustrating his book. Many students were fortunate enough to purchase their own autographed copy as a keepsake. Kindergarten: With the winter came cold weather, and along with it came lots of creative ways to enjoy the energy of our Kindergarteners! We regularly integrate movement into our daily routines. We have watched interactive dance videos on the smart board, as well as helping our focus by participating in Yoga. Simply having the opportunity to use the smartboard to do writing, mazes, or math makes it more fun for everyone! The children get to move around many times throughout the workday. We compared and contrasted Animals and Plants in Science and are now beginning to study Earth and Sky in Chapter 3. One of their favorite experiments is predicting whether an object will sink or float. Often this is chosen as a free play activity by their own choice. In Math we have begun to learn about number lines and how to use them with addition. We have learned how to count, read, and write numerals 11-20, while also using logical reasoning to solve problems. The children have explored how to work with a hundreds chart to fill in missing numbers and to understand patterns. This proved challenging but everyone has succeeded! We are just diving into counting groups of ten and listening to stories about joining groups with addition. We use the children and objects to demonstrate such stories which helps the children visualize the math concept as well as learning about it kinesthetically. Our phonics curriculum is moving along at a pretty steady and fast rate as would be expected at this point in the year with all of the reading taking place within the class. The children have learned about the consonants L, D, N, W, C, R, Q and P. Recently, we jumped into the Long Vowel sounds and each student completed an extensive Vowel Booklet that we worked on for two weeks. To help encourage all of my emergent and fluent readers, the children are given a “Book-in-a-Bag” weekly for them to read and review. The books are assigned according to each child’s reading level. Journal writing is an area where I’ve seen lots of growth. The children are practicing phonetic spelling in addition to writing the high frequency words we have been talking about since September. They are given a writing prompt or sentence starter, and then they fill in the rest with their own ideas. We presently have 39 words that we review. Dr. Martin Luther King Jr. was celebrated and honored as the children drew pictures to demonstrate what their “dream” would be for the world. Many different thoughts and visions were shared! This was then followed by the class painting a huge heart using their hand prints with all different shades of skin color. We have had an introduction to Mongolia and have discussed similarities and differences of life in Mongolia compared to life in New York. First Grade: First grade has just finished our first author study! We examined the books by Adam Lehrhaupt and The Chicken in ….. Series. We compared and contrasted each text and discussed the main character, secondary characters and central theme of each book. We will continue our next author study looking at the books of Peggy Parrish, author of the Amelia Bedelia Series. In math, we are finishing up collecting data, making and interpreting graphs and exploring the relationship between addition and subtraction facts (we have been working on these two topics simultaneously). We will now concentrate on subtraction and addition separately, using a number line and how to add more than two numbers. Several first grade students have even begun to learn multiplication! In science, we have finished plant and animal life and will now focus on the Earth and Sun. As a culminating activity, planet reports will be assigned with information and a grading rubric to follow. In social studies, we are beginning our next unit on the past and colonial days. We have just finished common nouns and will turn our attention to proper nouns along with verbs and adjectives. We will even have an “adjective fashion show” when we walk the runway and describe our outfits using as many adjectives as possible! Each student is continuing to grow as a reader – all reading groups have moved up to the next basal reader! Second and Third Grade: We began the New Year by looking at the area surrounding Mongolia and studying the environment and wildlife seen throughout the area. Both classes have explored multiple ecosystems found throughout Mongolia, comparing and contrasting, while identifying unique characteristics found in each. Our class has specifically looked at identifying traits in animals that allow them to thrive in difficult environments. Second grade is transitioning from double and triple digit addition to subtraction. Third grade has developed a strong understanding of single digit multiplication and is now tackling division. Vocabulary in both grades has been extremely impressive with second and third grade doing an exemplary job not only developing their catalog of words but also using them in their morning journals. We, as a class, have put a major emphasis on developing and exercising our writing skills with morning journals as well as writing samples throughout the week. Students are expected to include proper handwriting techniques, newly used vocabulary, and more complex sentence structures in their daily writing. Both classes have done such an amazing job rising to the occasion. Second grade is now currently exploring how our community grows through goods and services. Third grade recently completed an exciting section on cultures and traditions found in our country. They will be moving on to the major regions of the United States and the climates of these regions. Science continues to be very “energetic” with second grade exploring plants and animals and third grade studying various forms of energy. In science, second grade will be getting “swept up” soon by erosion and weathering in the upcoming chapters and third grade will begin classifying plants as well as studying their life cycles. Grades 4 and 5: We started the New Year with a new T-D family member and are thrilled that Chloe has joined our class. We have been super busy, especially in Math. 5th grade has now moved on from multiplying and dividing decimals to the order of operations, or PEMDAS as we like to say. 4th grade is moving on to the big leagues now with double digit by double digit multiplication. We have tried out many different multiplication methods and everyone has discovered a way they are comfortable with. I recommend that each student takes advantage of the school’s IXL.com to build upon their fluency. Both grades are truly enjoying our novel study- Addison Cooke and The Tomb of Khan. We are enjoying this adventure story about a group of kids on an archaeological treasure hunt while learning about Genghis Khan’s dastardly deeds. In Grammar we are all working on adjectives and the many pesky exceptions of grammar rules in the English language. The 5th grade Science class has started the Con Edison Smart Kids energy saving program. Each student was given energy saving light bulbs, a water conserving shower head and water faucet. This is a great program that is only offered to 5th graders, free of charge, through a grant from Con Edison. I know the 4th graders are looking forward to this unit next year. We enjoy our Current Events time each week when we read the Scholastic News together as a class and discuss current events in this age appropriate newspaper. Our favorite feature is the Weekly Debate, where the students and I debate a certain topic. Last week’s was whether student’s benefit from homework. Surprisingly, my opinion was different than the majority of the students. Each student must support their opinion with either facts or examples that support their position. We hope you have enjoyed this “glimpse” into the Lower School’s creative curriculum.